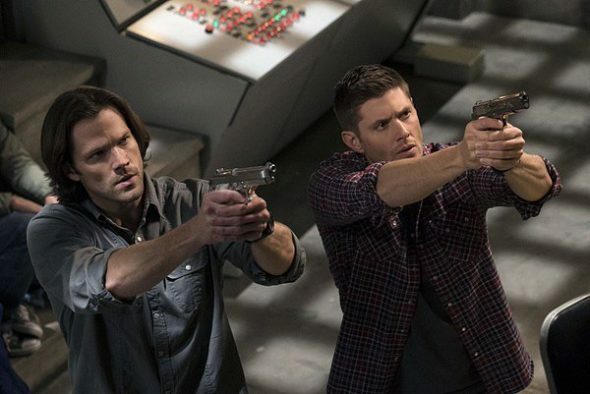 At the Saturn Awards, where they presented an award to series creator Eric Kripke, Supernatural stars Jared Padalecki and Jensen Ackles talked about what is in store for their alter egos Sam and Dean Winchester in the 12th season of The CW‘s Supernatural TV series. Supernatural season 12 premieres Thursday, October 13, 2016 at 9:00 ET/PT. Misha Collins and Mark Sheppard are also series regulars. WARNING: Spoilers for the season 11 finale and the upcoming season 12, after the jump. Prior to leaving with her brother Chuck/Carver Edlund/God (Rob Benedict), Amara (Emily Swallow) rewarded Dean for reuniting her with with big bro, by giving Dean “what he always wanted,” his late mother Mary Winchester (Samantha Smith). Morgan has been in high demand as of late. He played JD Richter in the second season of Halle Berry’s Extant TV series, which was cancelled in 2015 by CBS. In addition to making a couple of films in 2015 and 2016, Morgan also played Jason Crouse in the final season of The Good Wife, and was introduced as the notorious Negan in the sixth season finale of The Walking Dead on AMC. So yes, he is a little busy. Per TV Line, Ackles and Padalecki have a meeting scheduled with Supernatural‘s latest showrunners, series vets Robert Singer and Andrew Dabb. In re: Mary’s return, the report quotes Ackles as saying, “[My reaction] was kind of like, ‘What’s going to happen now? How is this going to work out’?” Knowing the Winchesters’ track record over the past 11 seasons, “Not very well,” seems to be a safe bet. On Instagram, Ackles shared a picture of himself on the way to the Saturn Awards. On Twitter, a fan tweeted then-and-now shots of Kripke, Padalecki, and Ackles, which Padalecki retweeted. Fans of the show can tell the “then” shot is pretty early on in the series’s timeline, thanks to the sentient being that is Padalecki’s hair. What do you think? How do you feel about Mary appearing in Supernatural season 12? Do you think we will ever see Jeffrey Dean Morgan as John Winchester, again? More about: Extant, Extant: canceled or renewed?, Supernatural, Supernatural: canceled or renewed?, The Good Wife, The Good Wife: canceled or renewed?, The Walking Dead, The Walking Dead: canceled or renewed?